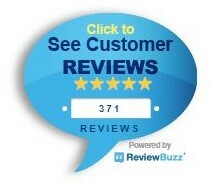 Are You in Need of Restoration for Water Damage in Denver, CO? Every year, fire and water damage costs homeowners and business owners throughout the country millions of dollars in damages. If you've dealt with the aftermath of a sudden attic fire, frozen pipes bursting, or a basement flood, you understand the stress, danger, and financial burden associated with the clean-up process. In times like these, it helps to have a trusted fire and water damage restoration and cleanup service on your side. When the unexpected occurs, our experienced team is ready to help. If you need help recovering from fire and water damage, our family-owned-and-operated company steps in to restore homes and businesses. Procuring the help of a restoration company is not stressful or time-consuming when you choose our trained and insured specialists. From small jobs like trash removal to larger ones such as severe mold remediation, we're ready to help with a variety of different damages and accidents. One of the most common questions we get is: at what temperature do pipes freeze? The simple answer is 20 degrees F. However, freezing events can also happen even when the temperature stays above that. Pipes which are exposed to cold air, especially flowing air such as the wind blowing on a chilly day, are susceptible to freezing at temperatures above that threshold. The level of exposure can be as minimal as cracks in an outside wall or a simple lack of insulation over the pipes. The temperature at which pipes freeze is not the only factor which affects your home water supply, so oftentimes only an expert can determine the true source of a freezing problem. When it comes to ways to prevent frozen pipes, prevention can be half the battle. Our team knows exactly how to fix frozen pipes without damaging them. With skill, experience, and access to all the tricks of the trade, our professional staff is happy to help you get on with your life. You don’t have to wait for an appointment that’s days away, either, because we are available 24 hours a day, 7 days a week. If your pipes freeze, you don’t have to stand outside with an extension cord and a hair dryer trying to accomplish the impossible. We have professional-grade equipment and training that allows us to accomplish unfreezing your pipes quickly and efficiently. You can have running water again before you know it when you rely on our friendly and professional team of specialists. When you have a frozen PVC water pipe, you may hear unusual sounds, such as whistling, clanging, or banging. 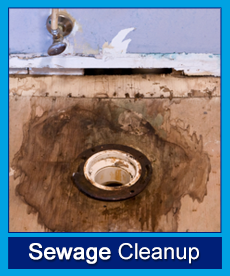 You may also notice very unpleasant smells if the frozen pipe is affecting your sewage drainage. Damp drywall is another dead giveaway that you should never ignore, and sinkholes in the yard can actually be a sign of backup as well. The most obvious sign is a bulge in pipes which are exposed. If you see a bulge in your pipes that wasn’t present before, don’t ignore it. Make sure you call our team before it’s too late. 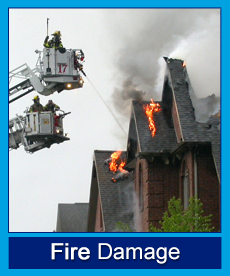 Very few homes or businesses come out of a fire or flood unscathed. 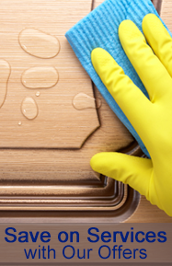 Even if the damage is not visibly apparent, you and your family or your employees could face a host of issues lying beneath the surfaces of your building. Whether you're dealing with a flooded basement or a scorched roof, make the smart choice for your property by contracting our experienced fire and water damage restoration specialists to make sure all your bases are covered. Only an experienced restoration company can provide the complete cleanup and rebuilding services you need to ensure your home or business is ready for use or habitation once again. 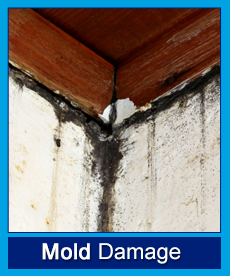 With fire comes smoke damage, and with water comes the threat of mold and mildew. Our team has the tools and experience needed to fight these aftereffects and restore your structure to its original condition. Dealing with the aftereffects of big storms, wildfires, or even an earthquake can be a traumatic and stressful experience. It's hard to know where to begin piecing your life back together if your home or business was heavily damaged by a disaster. Gain a little peace of mind by recruiting restoration specialists that are committed to helping you get your life back on track. Emergencies don't happen in a convenient nine-to-five window. Storms, floods, and other accidents come without warning, and in your hour of need, it helps to know that our cleanup service is ready to respond to your call at any time. Contact our specialists 24 hours a day, 7 days a week, for rapid disaster cleanup services or other restorative assistance. We respond quickly and professionally. Our crews prioritize safety and customer satisfaction in every project we undertake. Accidents and disasters cause a great deal of stress, so we want to understand our clients' concerns. 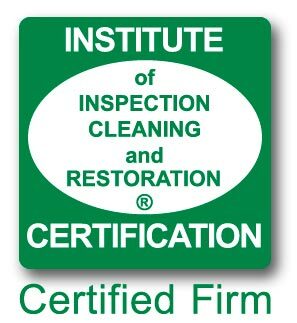 Our IICRC and EPA-certified technicians tailor their unique abilities to suit the needs of each client, allowing us to deliver a professional cleaning and restoration experience every time. Crime and trauma scenes are more than just disturbing – they can be substantial potential sources of biohazards. From bodily fluids to dangerous substances, it can be difficult to clean up the sites of such incidents. That's why our professional crime scene cleaners are ready to come in and sanitize any area exposed to hazardous fluids and materials. Rely on our cleanup crew for assistance in dealing with crime scenes, murder scenes, auto accidents, and more. Our technicians understand the sense of tragedy and fear that victims and their families feel after an unfortunate incident occurs. When you're struggling to work through emotional and psychological trauma, it helps to have experienced and compassionate professionals who respect your grief as well as your space. You and your loved ones or employees can rely on our team to sanitize any area with exceptional compassion and attention to detail. Do You Have a Flooded Basement? A flooded basement is more than just an inconvenience - it's a health and safety hazard. Whether you're facing flooding at home or at work, sitting water contains a good deal of harmful bacteria and other contaminants. The longer it sits, the worse the effects water will have on your flooring and walls. 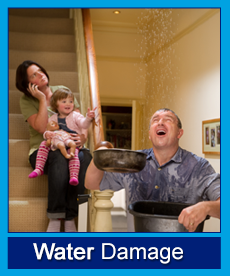 Thankfully our team specializes in dealing with severe water damage and similar flooding consequences. From damage caused by minor leaks to massive floods, no project is too large or too small for our water damage restoration company. Contact us as soon as you notice sitting water in your building - the faster we arrive on-scene to help patch your home or business up, the less severe the damage will be. We bring more than 150 years of experience to each building we restore to a better-than-ever condition. 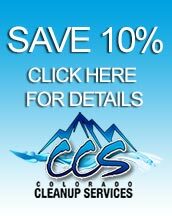 For a limited time, Colorado Cleanup Services is offering a 10% discount on our water mitigation service. To qualify for the discount, we must receive payment within 2 business days of completion of the water mitigation service. Insurance Claims do NOT qualify for the Discount Promotion. This offer only applies to water mitigation and cannot be applied to damage restoration or other non-water mitigation related services. 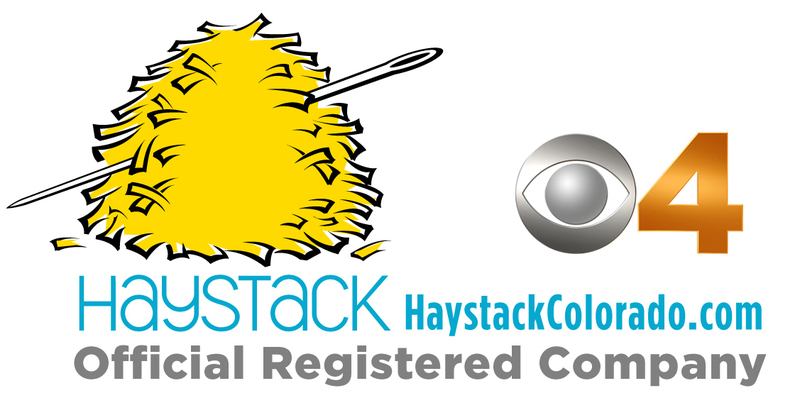 Call us today at (720) 388-1005 to discuss receiving your 10% discount! Trash and debris left over from restoration and cleanup service can pose a health threat to your loved ones or employees. Ensure your own safety and the safety of those around you by scheduling prompt trash removal with our restoration company. We specialize in handling dangerous materials, including asbestos, mold, and even biohazards. You never have to risk your health to get rid of unwanted trash when we're on the job. Contact us today to find out more about our comprehensive services. 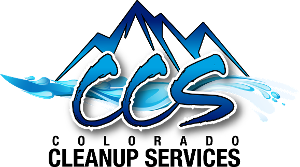 We proudly serve customers in Arvada, Aurora, Lakewood, Englewood, and Westminster, Colorado, and the surrounding areas.